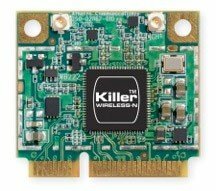 Engadget reports Killer Technology (formerly known as Bigfoot Networks) is preparing to deliver the Wireless-N 1202 WiFi module with Bluetooth in May, while the Killer E2200 gigabit Ethernet controller is already shipping.
. Qualcomm Atheros is actually doing the honors, as it formally reveals the Killer Wireless-N 1202 WiFi module with Bluetooth as well as the Killer E2200 gigabit Ethernet controller. Each one is aimed at DIYers and OEMs, enabling machines based on them to automatically classify and prioritizing gaming, video and audio network data -- a bit of behind-the-scenes black magic that's said to "provide a superior, uninterrupted online entertainment experience." As you'd expect, both will include the Killer Network Manager software on associated rigs, giving end users a borderline ridiculous amount of control over how bandwidth is used.